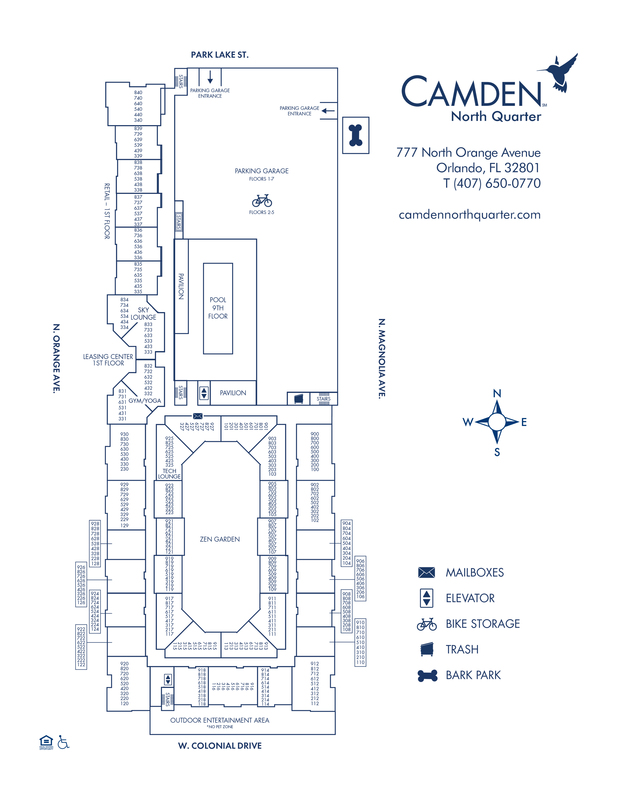 Camden North Quarter is Downtown Orlando living at its finest. Our studio, one, and two bedroom apartment homes reach nine stories into the urban skyline - located in the North Quarter District. Enjoy great entertainment and dining options right outside your door. Hop on a Pedicab or take a bike share to a Magic game at Amway Center, see a play at the Dr. Phillips Center for the Performing Arts or enjoy the amazing food and drinks at so many great restaurants and bars just a few blocks away. Need to commute outside of downtown? No problem! SunRail, Lynx, and LYMMO will get you anywhere you need to go in Orlando. You will fall in love with our open concept floorplans with full-size front loading washer and dryers, wood inspired flooring and large windows that let in the natural light with views of Downtown Orlando that will take your breath away. Cook up a scrumptious meal in your beautiful kitchen using the spacious quartz countertops in tandem with your stainless steel appliances. Need to unwind at the end of the day? Have a glass of wine on your patio or enjoy some bubbles in the luxurious garden tub. Granite countertops and walk-in closets complete the spacious bathroom that gives you plenty of room to get ready in the morning or for a night out on the town. Head up to the 9th floor where gorgeous rooftop views and plentiful amenities are steps away from your apartment home. Bask in the Florida sun at our gorgeous rooftop pool. Relax in a hammock chair, entertain your friends, or play a game of billiards in the sky lounge. Need to get in a workout? The gym and yoga studio provide all the equipment you need to get into shape and stay healthy. Hungry? Grill burgers and steaks at our outdoor grilling patio complete with relaxing green space to enjoy your yummy eats. Pets are always welcomed at Camden North Quarter. Socialize with neighbors and pups at our private dog park where little dogs and big dogs have their own separate play area. There are many great parks and lakes just a few minutes away. Take your furry friends down to the Farmer’s Market at Lake Eola every Sunday to pick up your fresh fruits and veggies for the week. Many restaurants and bars such as World of Beer, Dexter's of Thornton Park, Relax Grill, and Teak Bar and Grill host yappy hours or allow pets on their outdoor patios. Enjoy life just north of bustling downtown Orlando and come home to the urban lifestyle where you will be #LivingTheLatitude at Camden North Quarter. Call today to make an appointment and see for yourself! We welcome cats and dogs, up to two pets per apartment, with no weight limit. Breed restrictions apply. We do not permit American Pit Bull Terrier, American Staffordshire Terrier, Staffordshire Bull Terrier, or any other dog or breed deemed aggressive.